Sanjeevini Homestay: Honnemaradu "Heaven for Water Sports"
Honnemaradu "Heaven for Water Sports"
Honnemaradu (a place of golden sand) is a tourist place situated on the back waters of River Sharavathi. It is in Shimoga district, Karnataka about 15 km from Sagara on the way to Jog Falls, 12 km from Talaguppa and 392 km from Bangalore. With reservations, visitors in groups of at least 12 can stay overnight, with facilities for food, shelter and equipment rentals nearby. Honnemaradu is one of the most beautiful man-made lakes in Karnataka. Honnemaradu, the village, having been engulfed in the mid-1960s by the Liganamakki dam, has been literally resurrected today. The wonderful climate, clear brisk air, and the breathtaking views attract hordes of tourists. The place is well maintained and naturists have tried to retain the eco-friendliness of this area by prohibiting smoking, boozing and use of mobile phones, other electronic gadgets, and chemicals, even in the form of soap and shampoo. One certainly does not find the need for anything at all here, even a wrist watch. It feels as if the time has taken a break here. The peace and the quiet of the surrounding area is a soothing balm to one's soul! Honnemardu is a visual treat, offering a view of the mountains, verdant trees, vast expanse of water, islands. Honnemardu gives a excited experience in water sports to its tourists. Camping: Camp sites at Honnemardu are perfect to experiment with tent pitching and shelter building. An open campfire is a wonderful way to compliment a meal under the stars. One will also learn the philosophy of no trace camping to emphasize the spirit of environmental conservation. Coracling: Coracles are unique round crafts that are sturdy on flat waters, and thus used as an introductory boating activity. Due to their shape, they can spin wildly in circles, making them the main attraction for first time boaters. Coracles are ideal for small groups of 4 to 6 people. Canoeing: A canoe is a two seater, open decked boat that demands both balance and coordination. Having had a basic explanation of paddling strokes by the volunteers, one can experiment with its maneuverability and navigational finesse. 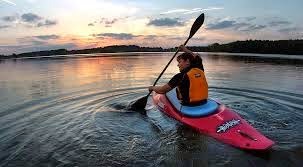 Kayaking: A kayak is a small, narrow single seated boat primarily designed to be manually propelled by means of a double-bladed paddle. An individual’s concentration and technique make for a challenging undertaking. 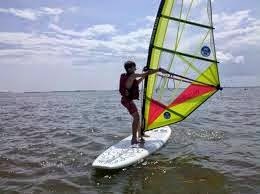 Windsurfing: Windsurfing is the most demanding of aqua sports offered at Honnemaradu. It requires boat balance, control of the sail and an understanding of the winds. It tests strength and stamina and is intended for people who opt for bigger challenges than those provided by boating. By Road. Shimoga is 274 km from Bangalore. Take a bus from B'lore to Shimoga and another bus to Talaguppa from Shimoga. Taxi service plies one from Talaguppa to Honnemaradu. Taxi and Jeeps can also be hired from Shimoga to Honnemaradu. By Train. Take a train from B'lore to Shimoga. Travel by the famous Rail bus from Shimoga to Talaguppa takes about 3 hours. Taxi service plies one from Talaguppa to Honnemaradu. It is about 40 minutes drive between Talaguppa and Honnemaradu. Sagar is the town nearest to Talaguppa.